It’s always good to stay close to your place of work/meetings etc in Mumbai, the city of traffic jams. Here are some lovely hotels that are within the walkable distance from Express Towers at Nariman Point in Mumbai. If you are fond of small boutique hotels, you will love Intercontinental Mumbai. Along with the charm of a boutique hotel, it also provides the luxury and amenities of a modern hotel that you would expect from any global chain. Walking distance from Express Towers and Air India building, Intercontinental is a great place to stay. 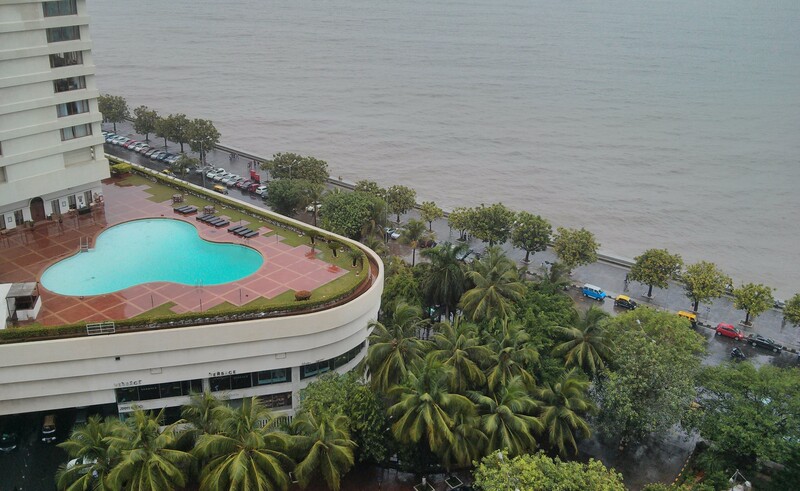 You can book a sea-facing room as well at Intercontinental Mumbai. It’s a part of IHG Rewards loyalty program. If you are planning to stay for several nights, enrolling for paid Intercontinental Ambassador program might be a good idea. Even though it is not free, but late checkout, elite membership, Buy One Get One free hotel night certificate and extra amenities in the room make it a good deal. Trident Nariman Point is located right opposite Express Towers. In fact you can see its pool and building from the higher floors of Express Towers. Trident Nariman Point is a grand hotel with several restaurants, a shopping arcade and a couple of cafes. They also offer sea-facing rooms. Trident Hotels Group runs it own loyalty program called Trident Privilege. Trident’s swimming pool as seen from Express Towers. Marine Plaza is another good option to stay close to Express Towers and Air India Building. It’s a compact hotel with a vintage touch. Apart from a few isolated complaints, this hotel has a good track record of positive reviews as well.